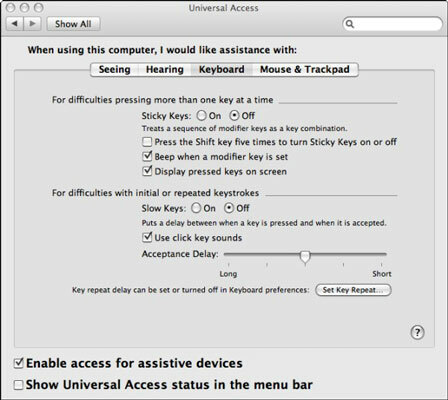 You can access the Keyboard pane through the Universal Access dialog on your Mac. The Keyboard pane offers several settings that can make using a keyboard easier, especially if you need special accommodations. If you have difficulty doing complex key presses, like the Command+Option+= combination for Zoom, try turning on Sticky Keys. The Sticky Keys option, which is controlled from this pane, lets you press the keys one at a time to effect the desired combination. For example, you would first press Command, then Option, and then the equal sign (=). You can also control what feedback OS X gives you when you do this. Another problem some people have is unsteady hands; they may accidentally press a desired key more than once. Another option on this pane lets you set a time delay between key presses to reduce this problem. You can find additional settings related to the keyboard in the Keyboard & Mouse window of System Preferences. A number of specialized keyboards are available to assist with various problems, ranging from repetitive stress injuries to users who can use only one hand. As long as a specialized keyboard uses a USB interface, the keyboard should work on a Mac.